Happy Fourth of July, friends! I hope you're spending the day doing something relaxing... beach? cookout? crafting? We've been blessed with beautiful weather here on the Cape for the holiday. I did a little of the beach yesterday, a cookout tonight and some crafting today. So all in all, a great holiday. Although I must admit as much as I enjoyed getting a base tan for my vacation at the beach with my bestie, yesterday wasn't the best of days. I got bit by a dog on my walk yesterday morning -- no worries, he only caught my pants (he ripped a whole in them, though!). Thankfully, they were just my workout pants. And then last night I scraped the decorative wall in my sister's driveway with my new car. I'm so bummed. Good news is that it shouldn't cost too much to fix. Just an added thing "to do." I'm a bit ridiculously sad about it, though. For those of you that know me, you know I get pretty attached to my cars. My last one I had for 212,000 miles. I literally cried when I traded her in last year. Me and Rosy were partners in crime (not really -- there were no crimes!) for 10 years! My new little car and I are relatively new, but I feel so sad that I hurt her (yes, I know, I'm nuts). But no worries, it's just a car. I'll get her fixed up good as new. The best part is that no one was hurt. I'm mostly just mad at myself as it was totally preventable. I was just being dumb. Anyway, I do have some craftiness to share with you today. This card is actually the "thank you" card my Stamp of the Month attendees will get this week. I'm hosting one more class before my amazing vacation to Thailand courtesy of Stampin' Up (I still can't believe this is happening)! 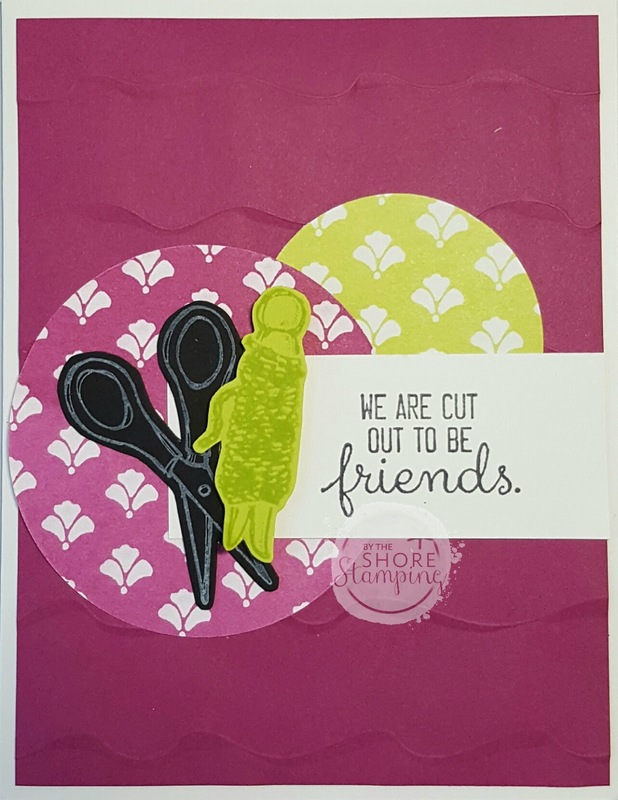 Stamp of the Month class features one stamp set (this month it's the adorable Crafting Forever set) and we make four "stepped up" cards -- this month we're focusing on coloring with blender pens. Each month I also make a fifth design to give everyone as a thank you for attending class (or purchasing the "to go" kit). That's the card I'm sharing today. Guests also get a hand-stamped thank you gift from me, too. I like to spoil my stampers at this class. My Teach Me Tuesday video this week features this card. So you can watch that HERE and see how I made this card using the 3D Dynamic Textured Embossing Folders from Stampin' Up. Would you like to get the kits "to go?" All you need to do is order the Crafting Forever stamp set and the two inks we use (Lemon Lime Twist and Berry Burst) in my online store using this month's hostess code: TTV2TRT2. Then shoot me an email at jen pitta (at) comcast (dot) net and let me know you'd like one of the kits and I'll pop one in the mail to you. Be quick, though, as I only prepped 10 kits this month. Okay... that's all for today. I have a ton of stuff to do to get ready for my trip. I hope you enjoy your Fourth of July! A special shout out to all the military personnel (past and present!) that have worked so hard and sacrificed so much so that I can be free. Each and every one of you are my hero. Thank you!